Take a look at our slideshow of Labor Day recipes. What I’ve noticed lo these past 18 years is our cavemanish-tossing-of-meat-onto-flame season comes in like a lion and goes out like a lamb. Or rather, comes in like a steer and goes out like a lamb. Once Brunhilde is disrobed, exfoliated, and polished, we descend upon her with trays of hamburgers, and…wait for it…hot dogs. Yes, hot dogs. And not just any hot dogs. Ball Park Franks, because they plump when you cook ’em. We’ve craved the taste of grilled beef and questionable meat all winter, and it takes us a few weeks to satiate ourselves. Then around the beginning of August malaise sets in. How many burgers (cheesed or naked), hot dogs (plebeian or gourmet), racks of ribs, trays of grilled vegetables—especially zucchini—can you take? That’s when we start to look around for the different, the unusual, the utterly fantabulous. Once freed of our burger and dog lust, we dig into lamb chops and the thickest steaks; turn to the sea for shrimp, fish, and clams (yes, clams); grill every fruit possible (tip: don’t even consider blueberries); and even dessert. All of this is thanks to Jamie Purviance, who gave me a good-natured drubbing followed by an eye-opening education in all things grilling last summer. What we’ve assembled here are some of our best, albeit rather unconventional, recipes to help you cap off your summer with a wee bit of élan—and, if done right, a heaping helping of bragging rights. We’re not suggesting you pass on the burgers and beer, all we’re saying is give lamb a chance. What a luscious and well deserved spread to celebrate the accomplishments of working people! I do have to say I’m with you about the hot dog. 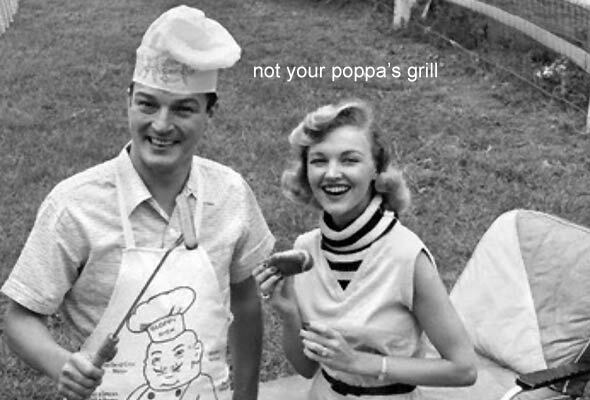 Sometimes we are all overcome with that craving for a hot dog on the grill…aren’t we? a good steak sounds great to me. yum. I have to agree! I’m headed to a Labor Day party and hoping there is a big fat steak waiting for me…..
Grilling is our go-to for weekend dinners. There are so many possibilities, but sometimes that hot dog hits the spot perfectly! I am a huge fan of your blog, and always look forward to new posts! Keep up the good work! Many thanks, Nate. Hey, feel free to drop us a line and let us know what types of grilling recipes you’re looking for when the craving strikes–that is, those nights when you’re not digging into some ‘dogs–and we’ll do what we can to oblige! And again, thanks for your time and your words.